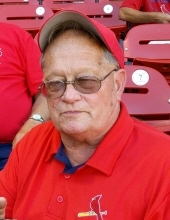 Jerry Lee Colwell, 74, of Alexandria, MO, died Thursday, January 31, 2019 at his home. He was born on November 24, 1944 in Keokuk, IA, the son of Elza “Poke” and Lorene Scobee Colwell. He graduated from Clark County High School with the Class of 1963. On July 4, 1989, Jerry was united in marriage to Cindy Hoyt in Alexandria, MO. She survives. Other survivors include three daughters, Tracy Colwell (Ted Burger) of Elizabeth City, NC, Danita Brewer (Russ Johnston) of Fernandina, FL and Jeri Lynne Baker of Alexandria, MO, one step-son, Clint Hoyt of Keokuk, six grandchildren, many great-grandchildren, two brothers, Dan (Cookie) Colwell and Randy (Barb) Colwell all of Alexandria, one nephew, Matt (Rhonda) Colwell of Alexandria and Melissa (Jeff) Hall of Knob Noster, MO. He was preceded in death by his parents and one granddaughter Meghan Brewer. Jerry had been employed at Keokuk Steel Castings for fifty-two years, retiring in 2015. Jerry loved the Mississippi River where he spent much time boating and fishing. He also enjoyed hunting. He was an avid St. Louis Cardinal fan. According to his wishes, there will be no services. "Email Address" would like to share the life celebration of Jerry Lee Colwell. Click on the "link" to go to share a favorite memory or leave a condolence message for the family.